I am purchasing a laptop for college soon, and I have several decals that I would like to put on the back of it. During my time in college however, I intend to take several internships, and I don't presently know whether or not I may need to use the laptop for some of these positions. 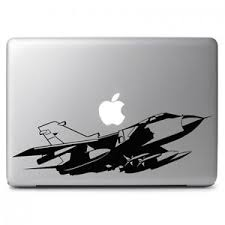 The decals I intend to use would not be considered inappropriate for an office (my college's logo and a few aircraft images), but I am worried that it may still be considered unprofessional to have decals all over the back of a laptop in an office environment. Is this likely to be an issue, or am I probably fine? "Being a professional" does not mean crushing your individuality. It means knowing what you're talking about and being good at what you do. The decals you describe sound pretty benign. Even if they weren't, a few minutes with some black electrical tape can do wonders. For that matter, it's unlikely that you'd bring your laptop to an interview. Once on the job, if the company wants you to have a laptop, they would issue you one. As long as there isn't anything edgy or NSFW on the stickers you will probably be fine. In the right company culture you might find many of the full time employees have their own! If you're going to work in investment banking you might reconsider, but otherwise you may just get asked to remove them. Many times you are not allowed to bring a personal laptop to work at all and this will be a complete non-issue. It's doubtful that your laptop will even be a concern for internships. Devices in most businesses need to be centrally managed to accommodate things like virus signatures and critical security updates. Rogue personally-owned PCs are frowned upon, because since the business doesn't own them, they have no control over what's installed on them. In certain high-security environments, they don't even want them in the building! Organized businesses, when they purchase, buy the same type (or family) of machine in bulk because it's easier to maintain than lots and lots of variations. Again, there will be little interest in supporting whatever brand you purchased when something's not working right. And then there's the issue of software you need for work - if you don't have it, such businesses are usually not interested in paying for expensive licenses on personal devices. The decals are the least of concern for a business, unless they're offensive. The ones that care more about projecting a uniform image and ease of maintenance/support will give you a machine to work on, so you won't bring your personal machine into work and it won't be a problem. The ones that care more about letting everyone work on what they prefer and expect people to manage their own machine, are generally in favor of personal expression and won't care about some (tasteful) decals, so it won't be a problem there either. Well, technically there might be a third type of company that is too cheap to give you a machine and too unprofessional to realize that they can't tell you what to do with your personal property in that case... you probably don't want to work for those. I have a slightly different take on this question. Other answers have noted that it's good to express something of your personality, but I would add to that that you might want to consider what image you are projecting. If your laptop has a SQL Server or Powershell stickers on it, I'll probably make some judgements about you. As other answers have noted, tech-related stickers are somewhat of an "ingroup signifier"/coolness on the hacker scene, so if you don't have tech-related stickers, and you do have non-tech stickers, I might wonder whether you are kind of new to the tech scene. Or maybe you don't really care about the tech scene. It's your choice whether you want to try and fit in in this way, but bear this in mind. People will make judgements about your politics and values based on this. I personally would be more inclined to hire you if you had the cutesey image, but maybe if you're going for jobs in defence or investment banks or something you would want the second (?). 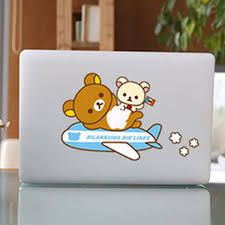 So my advice would be that you should decorate your personal laptop how you want, but you should think about the kind of image of yourself this will project. If you get a feel for the place and it seems inappropriate or you're self-conscious (or you have a competitor's decals, for example).... just buy an opaque hard shell cover for like 10 bucks on Amazon. Problem solved. 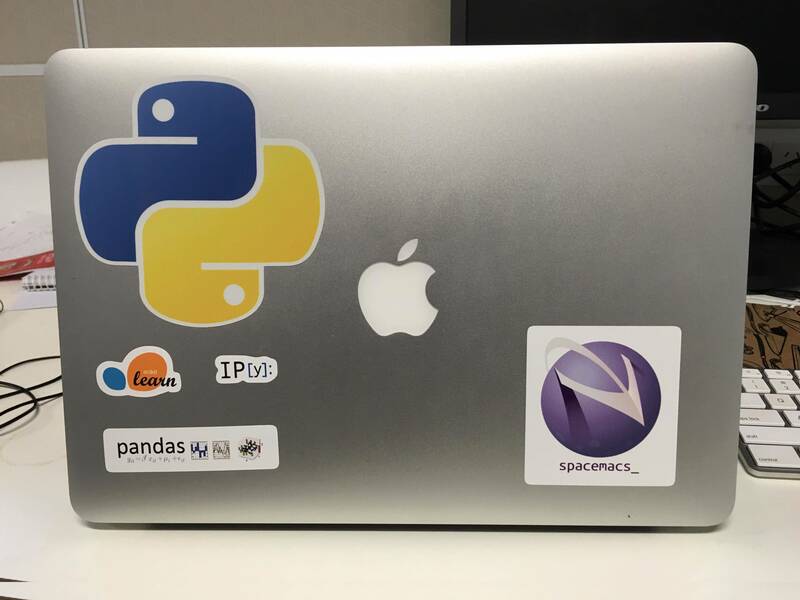 Decals on a laptop are very common in tech companies, and are often a badge of honor in hackathons. If anything, they're usually a positive thing. Up to a certain threshold, professionalism is a matter of perception and, what matter the most, of shared perception between you and the company. What I mean with this? I mean that a company could think that the only way to be professional is wearing a tie, another one could think exactly the opposite, and there is no clear stats unless you work in some specific environments or countries. I've seen in companies that didn't care at all about how good you were at your job, what did matter was the tie. I've been a project manager and did interviews myself, and I discarded all people that presented with a tie or those that where totally freaking nerds 'cause it was a small company and the team was working with a certain kind of spirit. I've met a guy who is running a hugely successful company in Milano and he hire only weird, crazy, nerd guys. Every company has its targets and decided its way to reach them; at the same time, you as a human being have a standard of what you feel is comfortable for you and the environment you want to spend a lot of your time in. So what you should be asking yourself is: "Will I look unprofessional in the context of the companies/countries I'm going to work, and do I really care to work with them? Is it acceptable for me to change myself to adapt to a certain company?" You can put stickers on your laptop, knowing that some (rare, I think) companies could see it as unprofessional and will ask you to remove them, and you can just ignore those companies and choose the ones that are more in sync with you. Or you can mask yourself and not put stickers because you feel you want to work for that a company. You can do whatever you want, as much as it makes you feel good! There's a ton of job out there to choose from, so choose what makes you happy. It is rare that you will need to use your personal laptop at work -- most corporate IT departments are hesitant to allow personally owned hardware to even connect to the corporate network, for security reasons. If you are working for a non-profit with low funding it is more likely, though. They make your laptop identifiable. The latter has tangible value in a corporate environment. Your school logo and a few airplanes don't seem objectionable, but as another poster has noted, there is a big difference in the images projected by a cartoon 747 versus a fighter jet. Tech stickers are very common, too, but you may want to think about what they say about you. I'd remove a sticker for my employer's competition, and probably for the competing technology to what my employer uses. I intend to take several internships, and I don't presently know whether or not I may need to use the laptop for some of these positions. If a company does not provide you a working station for your job but instead expects that employees use their own devices for the work in the office, then the company has to cope with the "risk" that a device of an emloyee boasts individuality and is not necessarily kept in a shape that is "adequate for business". You bought that device with your own cash and if it does not bear anything discriminating or violating the basic values of the company, it is purely your issue what is attached on the device. Being professional doesn't mean that you have to act like a soul-less zombie at work. If you want to put something on your laptop (even a company supplied one): do it. Usually, there's no issue at all. And as long as you don't put something really offensive there (whatever this means in your part of the world), even if your boss doesn't like it, it will be no problem: she'll tell you and you can choose how to cope with that critique. Not the answer you're looking for? Browse other questions tagged professionalism united-states or ask your own question. Is it unprofessional to pursue personal relationships with site users? How to deal with a person who perceives a culture problem on our team? Is it unprofessional to be motivated by personal concerns?